I caught Laura Ingraham in a BIG FAT LIE. Invented a fake news story to attack a gay icon and legendary Hollywood superstar. Used vicious innuendo to attack a gay-themed Oscar nominated film and gay men. Falsely asserted that Americans have no interest in independent films. Called Pixar director a phony for saying “marginalized people need to feel like they belong." Donald Trump and Fox News are perfect together. They’re both fact-free zones. While the current occupant of the White House loves to remind his audiences that he’s new to politics, he ironically claims to know more about politics than anyone else. He once famously remarked “Trust me, I’m, like, a smart person.” I neither trust him or think he's a smart person. Every time Donald Trump has a video camera or microphone in his line of site, he finds a way to slam and criticize the press. 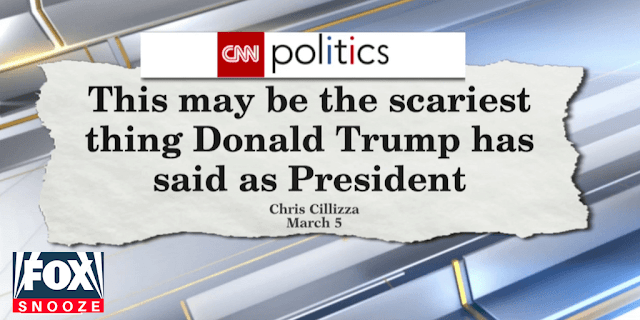 If he doesn’t like a story-line, or he’s portrayed in a less than flattering light, the lazy 'billionaire' cries and whines about ‘FAKE NEWS’, and falsely characterizes the mainstream media as a political opponent who supported Hillary Clinton for president. Most Americans, including some of Trump’s most ardent supporters, are tired of his claim that the press is victimizing him. Trump is victimizing himself, and the former reality television star lacks any self-awareness, and doesn’t recognize the role he plays in the negative press reports that we see and hear on a daily basis. 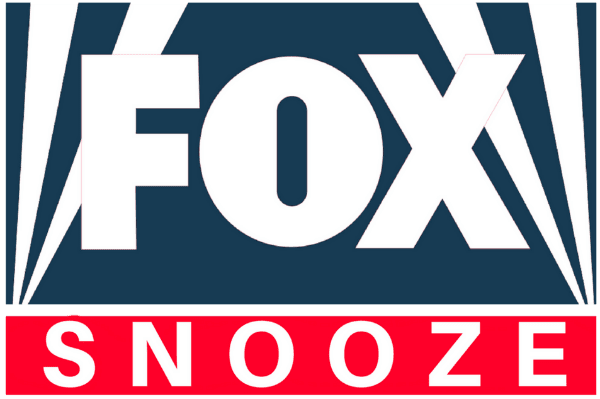 A key partner in Trump’s “FAKE NEWS” narrative is the FOX ‘SNOOZE’ NEWS Channel. With no requirement to be neutral or fact-based, this media organization is the perfect partner for a prevaricator like Trump. Fox uses Trump to bring in viewers and to push or promote their conservative political and business aims. Trump uses them to make policy pronouncements and cite alternative facts to support his wayward political views. Fox never questions or fact-checks Trump, and he LOVES that. He can call into a show, knowing that he will go unchallenged, which frees him to deliver his error-filled fact-free statements at will. Since Fox prime-time hosts don’t fact check their stories, they lack even the most basic journalistic standards. They make inflammatory and hyperbolic statements that appeal to a viewer’s emotions with no basis in facts. The hosts aren't journalists, they're partisan entertainers who are acting and playing journalists on TV. I recently caught part of a Fox Snooze show, and was appalled. I decided to fact check and validate the claims made by the show and the host. The American resistance media are lunatics. On Monday March 5th, 2018, one day after the Oscars, Fox Snooze entertainer Laura Ingraham slammed the liberal media and Hollywood 'elites' who gathered in Los Angeles for the 90th Anniversary Oscar presentation. 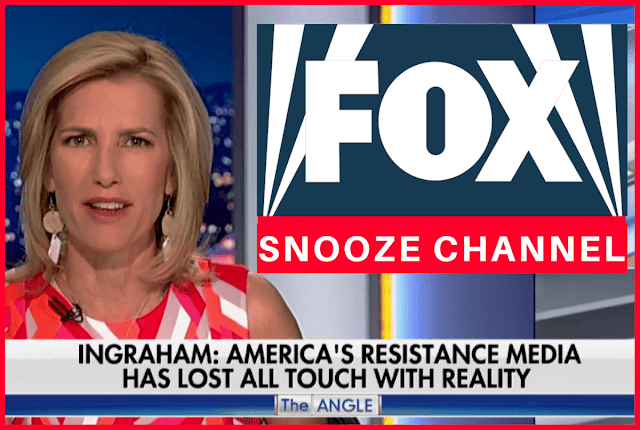 The incendiary Ingraham Angle segment began with “The humorless, out-of-touch American left” which was a piss-poor attempt to demonize and slander the opposition. She described “America’s resistance media” as a bunch of left-wing lunatics who have lost all touch with reality, while never acknowledging the scores of anti-Trump conservatives rejecting Trumpism with every fiber of their being. What's up with that? 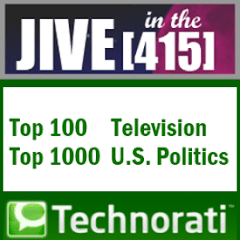 “America’s resistance media” is allegedly comprised of any media outlet (newspapers, digital media properties, TV and radio stations, blogs and websites, etc.) that relies on fact-based reporting and telling the truth about Trump. Lucky for us, anyone and everyone is a target of Trump and Fox Snooze's playground taunts, whether it's a non-partisan and objective news source, or a blog with a particular point-of-view. It's obvious that if one's views are different from and don't support Trump's narrative of lies, or his extremist agenda, he will attack you and get an assist from fact-free shows on Fox (like the Ingraham Angle). Shades of fascism --- is it not? TRUMP: He’s now president for life. President for life. No, he’s great. And look, he was able to do that. I think it’s great. Maybe we’ll have to give that a shot someday. Ingraham claimed that “liberal critics were apoplectic” over those comments, and she was right. She neglected to inform viewers that there were people on both sides of the aisle who were highly critical of both President Trump, and Chinese President Xi Jinping’s decision to eliminate term limits. 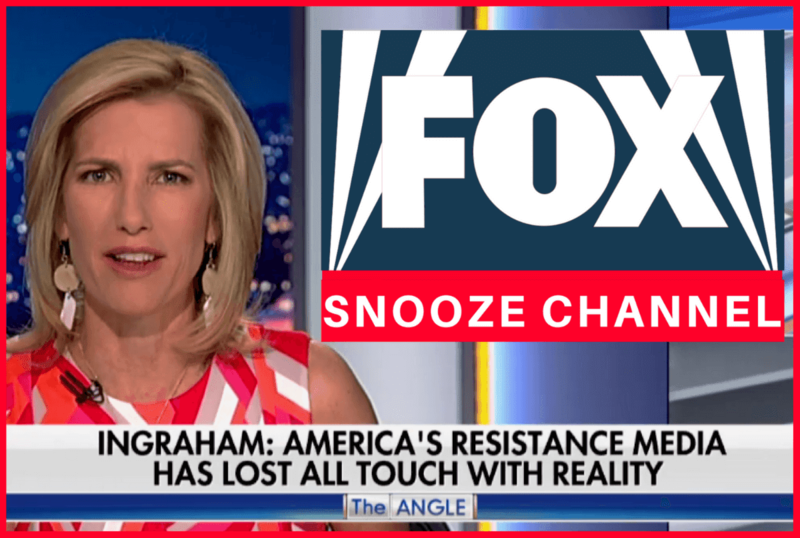 INGRAHAM: It’s obvious to everyone (this was a joke), except America’s resistance media, which has all but lost touch with reality. When Trump makes a joke he is endearing himself to the public. Celebrities and sports figures shoot their mouths off about politics and public affairs all the time, and we’re supposed to respond like Plato himself has returned and opined on the contemporary issues of the day. Everyone has the right to speak his or her mind. But you don’t get a free pass to offer illogical arguments and avoiding substance to just engage in drive-by media attacks. And you don’t get to do so with impunity. If you do that you shouldn’t be taken seriously. I regularly call out the elites who think their celebrity in one arena gives them the right to speak in another arena with heightened authority about all these complex issues of the day. Pot calling the kettle black. Ingraham calls out people she considers to be the ‘elites.’ An ‘elite’ entertainer criticising a fellow member of the ‘elite.’ I wonder how that’s going. Again, this selective argument fails to cite facts and is meant to fan the flames of discord and resentment, and that’s not productive at all. Using generalizations and hyperbole to attack everyone and anyone who doesn’t completely share one’s views in itself is a drive-by media attack. We live in an open society where our speech is protected. Since we’re all invested in our country, and in our future, we can weigh in on politics and public affairs whenever we choose. We ALL want to be heard and we want a government that is responsive to the needs of the people. That’s not a right-wing or left-wing view, that’s an American view. Why do right-wingers get so sanctimonious about criticism. Ingraham isn’t stupid, and while I largely disagree with her political views, I do respect her. What I take issue with is hypocrisy, hyperbole, lies, alternative facts, and knowingly omitting part of a story to support a point of view. A pathetic misguided and fact-free attack on a gay icon. No one bothered to call up the four senators from those two states, but our producers did. The four Senators said they didn’t speak to Barbra Streisand, and nothing was said about election fraud. Oops! Fox Snooze has a reputation for leaving facts out of a story, and her attack on Barbra Streisand was ignorant and completely contrived. Oops? Really? The last time I checked the state of Wisconsin had two Senators serving the people in Washington, and thirty-three state Senators serving the people in Madison, Wisconsin. Michigan has two Senators in Washington, and thirty-eight state Senators in Lansing, Michigan. Did her producers really call every Senator? NOPE. 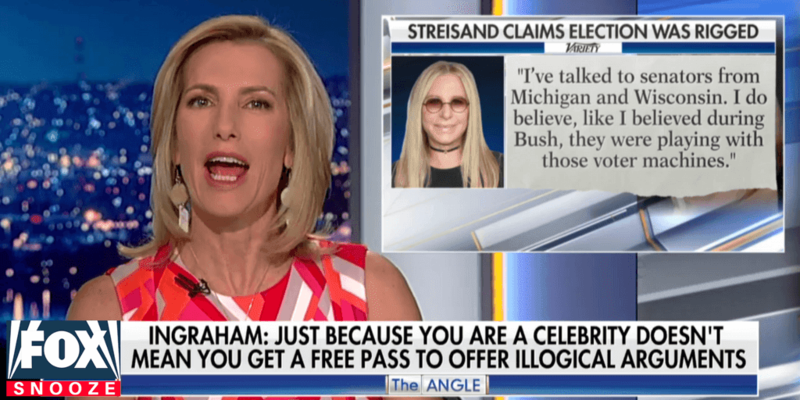 When Ingraham’s producers call the seventy-one state Senator’s in Wisconsin and Michigan’s state legislatures, and they all say they didn’t speak to Streisand, she can call her a liar then. Instead, lazy Laura Ingraham has zero credibility, because she invented a fake news story to attack a legendary entertainer and gay icon. She says a 'gay love story' is repellent to Americans. I disagree. She should own up to a 'gay love story' being repellent to her and the old straight white men watching Fox Snooze. Ingraham dissed the gay community in her rant, and she used insults, innuendo, and a wink to denigrate LGBT people. I found her statements to be both vicious and repellent. INGRAHAM: There were several Oscar moments that were repellent to the American public. Oscar host Jimmy Kimmel mentioned a film nominated for Best Picture. ‘Call Me By Your Name’ is about a 24 year old man who has intimate relations with a 17 year old boy. She obviously didn’t see Call Me By Your Name, but she did want to rile people up. That’s a vicious form of bigotry, which she knows is wrong and offensive, but she goes there anyway. KIMMEL: You don’t make films like ‘Call Me By Your Name’ for money. We make them to upset Mike Pence. Quite frankly I love that joke! I laughed out loud despite being ‘humorless’. No one watches indy arthouse films anymore. INGRAHAM: Actually, you might not thrill the American people, who saw few of the arthouse films celebrated at the tedious tinseltown love-fest last night. Let’s face it - these people are fanatics so they don’t care. Five 'arthouse' films, Call Me By Your Name, The Florida Project, Get Out, Lady Bird, and The Rider, were nominated for Best Feature film at the 2018 Film Independent Spirit Awards. Contrary to what Ingraham said, these indy films earned nearly $400 million dollars at the box office. Three other hit independent films, Beatriz at Dinner, Three Billboards outside Ebbing, Missouri, and The Big Sick, generated an additional $200 million dollars in box office business. According to Ingraham no one saw these movies, and I’m left wondering where the six hundred million dollars came from. Ingraham is WRONG again, and failed to do her homework. Identity politics - right-wing extremists love to divide Americans. UNKRICH: Marginalized people need to feel like they belong. Representation matters. INGRAHAM: Who are more marginalized in Hollywood than conservatives? Or Christian conservatives? Those people are complete phonies. Ingraham’s producers selectively edited the Coco creative team’s Oscar acceptance speech that representation matters. They did that to support their right-wing “Hollywood is full of liberal crazies” narrative, who pick on poor right-wing conservatives. Coco’s Director Lee Unkrich made a touching speech that personified acceptance and inclusion. His speech wasn’t left-wing or right-wing, it was American and reflects our values. It was about embracing our diversity and doing what is right, as opposed to rejecting racial, religious, or sexual minorities and stereotypes, which is wrong. Read Lee’s speech. It’s real and from the heart, and is devoid of politics. 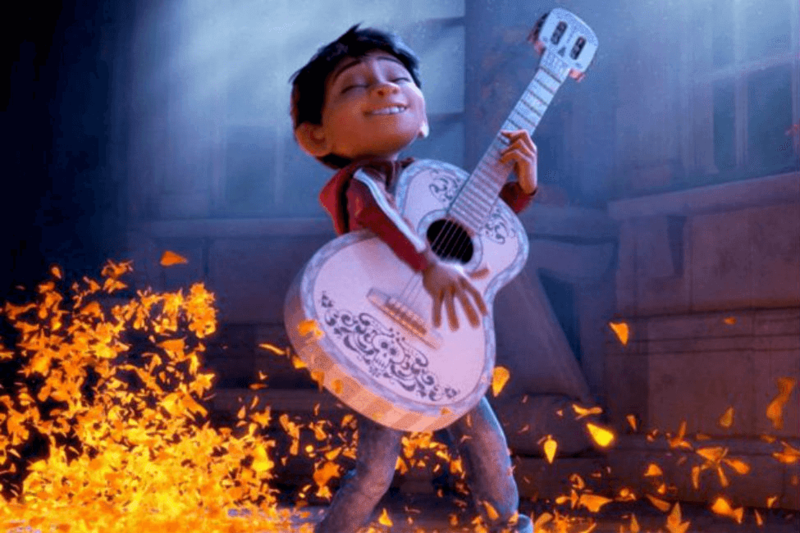 UNKRICH: With ‘Coco,’ we tried to take a step forward toward a world where all children can grow up seeing characters in movies that look and talk and live like they do. 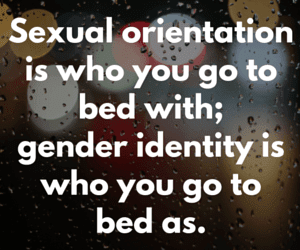 Marginalized people deserve to feel like they belong. Representation matters. Trump is disgraceful nasty and mean to women, people of color, members of Congress, and the press every day. This is where Ingraham goes completely off the rails. Trump can say and do whatever he wants, but if you criticize him, you’re a crazy left-wing lunatic. INGRAHAM: If you wanna know why these celebrities are so nasty to the president and so upset when he or any conservative [she points to herself] dares to crack a joke - well I have an answer. For all their vitriol and all their bile directed at conservatives and the president --- you know what he keeps doing -- putting it in a language that everyone can understand here --- and puts points on the board for America and the American worker --- and our audience is growing while Oscar’s audience is tanking --- Now that’s what I call funny and that’s the Angle. Donald Trump is putting points on the board for America and the American worker? Now that I’d love to see. Steel and aluminum tariff’s will likely result in a loss of manufacturing jobs and could jump start inflation. Eighty-two percent of the benefits in the big ‘tax cut’ the GOP brags about goes to millionaires and billionaires, NOT American workers. The paltry middle-class tax cut isn’t permanent and has an expiration date, while the billionaire tax cut never expires. Buyers beware! Fox Snooze uses propaganda to support and sell Donald Trump to the people, and their “product” could be subjected to a recall at any time. If you watch Fox News, remember that it's an entertainment network and NOT a news network. That's fitting for a network that fawns over the reality television star and accidental president. Facts matter. They don't matter to Fox Snooze, but they matter to you and me.